Happy Thanksgiving Eve! It has been in the 80's and 90's all week and I confess I have been super grumpy about it. My attitude has seriously stunk. We joked about going swimming at the beach today and later I saw my neighbor's daughter wearing her swimsuit. We really should have done it. Anyway, I could use a focused day of counting my blessings! There are so many! It will be wonderful to feast with our family tomorrow. I'm counting down the hours until I'm reunited with my mama's cornbread dressing and an array of casseroles. Praise the Lord. Here are the winners of the book giveaway. First let me say how much I loved all of the comments. Erica was so blessed by them that she offered an extra book for the giveaway. Yay! The winners of Those Silly Sisters: Swimming in the Rain are Liz and Sandy. If you ladies will leave me a comment with your contact info I will get in touch with you. Thank you to everyone who entered! You can find this sweet book online here if you'd like to order one. In case I don't get a chance to write tomorrow, I want you to know that I'm thankful for you. Have a very special day with your friends and family. Did you hear the huge sigh of relief coming from my house last night? We just finished a very busy couple of weeks and are so excited to have all of next week off. A couple of months ago my friend Lindsee, who is a girls minister at a church here in Houston, asked if I would share my testimony at her middle school and high school girls retreat. I always say no to things like this because it is just not what I'm spiritually gifted to do, but I told her I would think and pray on it. The only reason I gave it a second thought is because it was telling my story rather than teaching a Bible lesson. I really had a heart to share my story with these teenagers, but the issue was actually telling it up in front of them with a microphone. Eek! I can't even make announcements in my Sunday school class - in front of my friends - without my heart pounding out of my chest and losing my breath. So, I took a month (sorry, Lindsee!) to get back to her with my answer. I prayed and prayed and prayed and pestered my mom and husband for advice. I was really wanting them to tell me not to do it or for God to give me a flashing NO sign. That didn't happen. My friend Kay said I should do it. Mom said only I could make the decision and Curt told me he didn't think I could outrun this one. Great! One day I said, "God, I really need you to tell me right now whether you want me to do this or not. Please, just make it obvious!" The next morning I opened my eyes in a half-dream state and in my mind I was saying the things I needed to tell the girls. I'll call that a sign. As the day progressed I couldn't even remember what I had half-dreamed, but I had the grace to tell Lindsee I would come to the retreat. God's timing is so amazing. We went to LifeWay's women's leadership forum at Ridgecrest two weeks ago. Mom, Melissa and Curtis each spoke. The kids and I tagged along and we had a great experience. Curtis kept the kids and let me go to a lot of the breakout sessions. There were so many great ones to choose from. They are serious about equipping leaders! As I was looking through the list of seminars, I saw one by Rachel Lovingood (I will love her forever) that was basically about how to give a talk and be yourself. It could not have been more perfect for me. I took tons of notes and of course when I was preparing my talk I couldn't find them. But what she said got in there. Last week was super long. I was starting to get very nervous and I just wanted to wake up and it be the day after the retreat. My flesh was freaking out about the prospect of not performing perfectly. Gag! But that is a struggle for me. If I can't do something really well, I just don't do it. It was a fight to stay in the spirit in my thinking and there were a few tears shed. Curtis went out of town for two days, which made my preparation a little stressful. I needed to leave for the retreat at a certain time on Friday night and he literally walked in the door from the airport just in time. (I was speaking the next day but I needed to hear the other speakers.) God had mercy on me because I made it there in 15 minutes during rush hour and that is just craziness. Long story short, the retreat was amazing. Lindsee did a phenomenal job leading everything. The worship leader, Debbie, was incredible and I want to be her best friend. The other two ladies who shared their testimonies, Penny and Laura, were fantastic. The Gospel was boldly proclaimed through their stories as they testified of His power to transform lives. I loved being around the teenagers. I really miss student ministry. The weekend was just such a blessing. My story was the very last part of the retreat. The last ten minutes before I was to start, I thought I was going to pass out. Seriously. I was so nervous. Thank God Lindsee let me sit on a stool to share my story. Lots of friends were praying for me and, I have to tell you, as soon as I sat on that stool in front of the girls, God's grace was there for me. Oh Lord, I thank You for Your faithfulness! -I didn't sob the whole way through. Just a couple tears at the end. -There were some sweet adult leaders who were nodding their heads and smiling at me while I was talking. They encouraged me. -When I opened my Daily Light devotional book that morning, Micah 7:8 (which I was going to share) was the first verse listed. Wow. I told the girls that I used to drive down this long, dark, scary road late at night during my senior year. I would be afraid and would want to pray for God's protection, but because of how I was living, I told myself that I couldn't and shouldn't pray. I closed my mind to Him, which breaks my heart to think about. The retreat was at a hotel close to that road and although it would take me twice as long to get home, I turned my car right toward it. That road has now been redeemed. So, Curtis and I pretty much ditched The Precious (our TV). Can you believe it? Sometimes I can't either. You can read about our recent experience with God's pruning shears here on my friend Lindsey Nobles' blog. Lindsey and I met on the Compassion Guatemala trip. I've loved getting to know her this year. And now we are bonded for life whether she likes it or not! ;) Thanks, Lindsey, for letting me share my story. Be sure to check out the giveaway I posted last night for Those Silly Sisters: Swimming in the Rain. The comments have been so fun! Until the day I die, I will say that my mom may be a great speaker, writer, and teacher, but all of that pales in comparison to the kind of mother she is. She is the most encouraging, nurturing, thoughtful, kind, and generous woman I know. I appreciate how much time she spent just playing and being with my sister and me when we were children. She created magical experiences for us through her imaginative storytelling and willingness to be silly. We had so much fun together. Mom was always fully with us. She made us feel important and never acted like she'd rather have been somewhere else. She poured everything she had into our little lives and we knew that we were dearly loved. I want to be that kind of mother for my children, but I have found that it doesn't happen accidentally. It takes a lot of effort and intentionality. I have a friend named Erica Stidham who has recently published her first children's book - Those Silly Sisters: Swimming in the Rain. (I met Erica in high school. She was two years older than me but never too cool to be kind to a dorky underclassman. She is a very sweet and sincere person.) Erica has a heart to inspire mothers to intentionally create amazing adventures and whimsical memories with their children. I have been following Erica's blog for quite a while and I figured this out about her before she ever told me about the vision God had placed in her heart. She is always doing neat things with her girls! Even though I don't have a pair of sisters to call my own, I come from a pair of sisters and I was definitely charmed by this sweet book. The kids and I went to Erica's book signing a few weeks ago. I bought two books - one for us and one for a giveaway - and had them both signed. 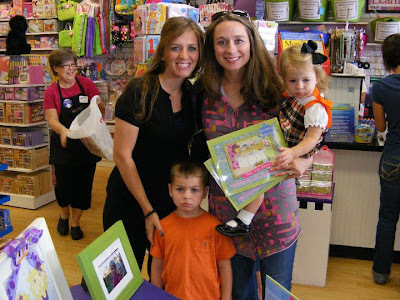 When I got to the signing table, Erica's little girls were hanging on both of her arms and she asked me if this is what my mom had experienced at her first book signing. It was so funny. Then we took this picture and Jackson's attitude erased at least 5 months off of my lifespan. Here's Erica with her darling silly sisters. If you'd like to enter the giveaway for a signed copy of Swimming in the Rain for the silly sister(s) in your life, leave me a comment with your name and where you're from. And for fun, share a neat memory from your childhood or a special experience you created for your children. I will choose a winner next Wednesday and announce it here on the blog. Blessings! Once upon a time there was a group of missions interns who served together during the long Houston summers at First Baptist Church. They spent those sweltering months living together in tight quarters, sleeping many nights in a row on shared air mattresses, working out together at Memorial Park, showering in the CLC, making lots of phone calls, helping Tropical Storm Allison victims, preparing lodging sites for youth groups to stay in (AKA cleaning bathrooms), praying over the city from the top floor of the Chase building downtown, driving back and forth to various airports, being poured into by mentors, and helping revitalize inner city churches by hosting mission teams. Within a span of a few summers, at least five married couples emerged from those intern groups. Having bonded through serving Christ together, they continued living that out in their marriages. One of those couples was Amber and Vernon Burger. From the start, the Burgers had big dreams of impacting Africa together. When I think back on my college years I can remember all sorts of confessions of big dreams by myself and the people around me. When I think of the Burgers the first thing that comes to mind is the fact that THEY DID IT! They did what they said they were going to do. A month ago you all went crazy (seriously crazy) buying hand held radios for $20 each to share the Gospel in Sudan. I heard from several friends at Aid Sudan and they were incredibly blessed by your partnership. Because I know of your generosity, I wanted to pass along the latest news from the Burgers. 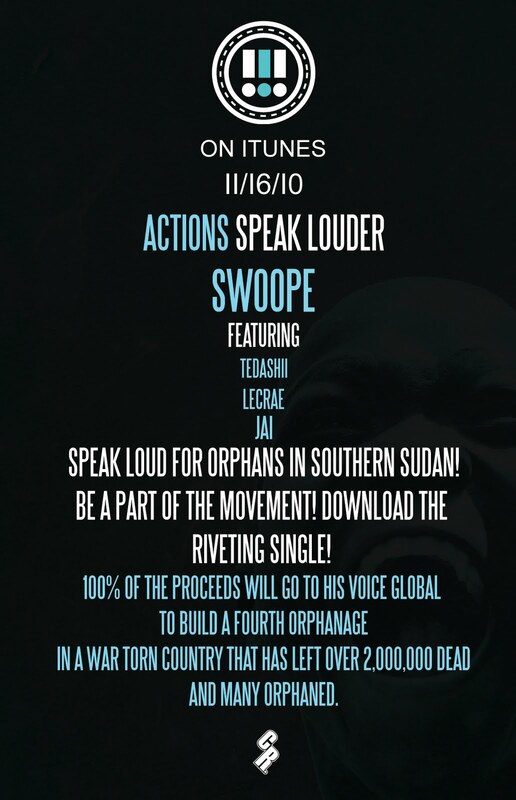 His Voice Global is raising money to build a third orphanage in Sudan. 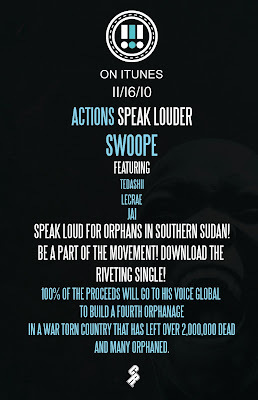 If you'd like to help, you can download the hip-hop song "Actions Speak Louder" on iTunes for 99 cents. (John Piper makes an appearance, y'all!) They are hoping for 100,000 downloads. Of course, if you'd like to give more than 99 cents, you can check out this page on their web site. You'll see that Living Proof Ministries (that's my mama's ministry) is one of their partners. We really believe in what His Voice Global is doing. Here's where you can get the song. My heart is so full tonight. I hope I can convey why. Here's a little (but you know it won't be short) recap of our weekend. If you only have a minute, skip to the Sunday part. I groan every Friday morning when Curt goes to work because it feels like it should already be the weekend and he should be at home with us. When we lived in Irving Curtis had Fridays off, so I think it stems from that. Anyway, on Friday I got to join all the LPM girls for Evangeline's birthday lunch at Tea for Two. We had a great time celebrating Vangie. Michelle injured her foot training for a marathon, so we had lots of fun with her crutches. It was a cold day and I was obsessing over Michelle's bandaged foot and her bare toes poking out. I kept wanting to find her a big pink, fluffy grandma sock (which she would have LOVED) to put over it. Michelle would want me to tell you that she was late for work that morning because she had to paint those toe nails. On Friday night we got brave and took the kids to a pizza place, which turned out surprisingly well. I bought a new pair of jeans in August that I really liked, but they quickly developed a hole in a very unfortunate place. I was nervous about trying to return them but, come on, after two months that is ridonkulous. What I did not know is that those jeans had been taken off the shelves for being defective and the store refunded my money without any problems. So this weekend I needed to get a new pair and I was determined to get them at a length I could wear with flats. After almost five years of motherhood, I am finally giving up on wearing heels. Except for church or other occasions when I'm not chasing and carrying my little ones, I'm going with flats or much lower heeled boots. I think I gave it a good run, but I just can't take it anymore. On Saturday morning I went to Nordstrom to take advantage of the Half Yearly Sale for my denim purchase. It was a total failure. After trying on like twelve pairs, I abandoned the Nord and headed elsewhere. With the help of an amazing saleslady, I found a pair that I liked and took the plunge and am having them hemmed. Eek! I've never done this before and I'm a little nervous. We'll see how they turn out. That night Kristy and Drew and their kiddos came over for dinner. I made enchiladas and they brought dessert, which ended up being a ding dong cake! Give Him praise, children! Since we had a legit cake, a little boy in the house whose second birthday is this Wednesday, and a stash of fun birthday decorations and candles, we had a spontaneous birthday celebration for little Levi. There weren't any presents but there were lots of balloons and party horns to amuse the kids. (Kim Safina, you made that possible. Thank you, sister!) The boys spent lots of time on the trampoline in the backyard. My heart was so happy seeing Jackson play with his friends. We had a great time. Our Sunday school class was brimming over with couples today! We seem to be growing every week and it's so neat. Before the church service started, we got to go on the children's floor that's being remodeled and write our kids' names on the foundation. Curtis and I found a corner far away from everyone and knelt down on the floor. He wrote Jackson's name and I wrote Annabeth's. Curt said, "Okay, we need to decide right now if we are having any more kids." Because if we were, we would need to write "Future Baby Jones." In case you are wondering, we did not write another name down. If it happens, we'll just have to figure something out! Then we held hands and prayed for our kids that they would love Jesus and that they would use their lives to serve Him. I wish I had a recording of everything Curtis prayed. We were both weeping before the Lord out of love for our son and daughter and in the joy of bringing them up to know Him. It is the most important thing in our life. Unfortunately, tonight I went to the funeral visitation of the mother of one of our Sunday school class members. It was heartbreaking to see our friends grieving the loss of this precious woman who means so much to them. I arrived at the same time as my friend Allison and I tagged along with her. Allison and her husband suffered the premature birth of their twins two years ago this January. If you read my blog back then you may remember me asking you to pray for them. They lost their precious baby daughter, Kate, at that time. I'm so blessed to tell you that Allison is unexpectedly expecting another little one. How great is our God? Tonight I watched my precious friend minister comfort to a deeply hurting family. Her words were so sincere and full of grace. She had an anointing of compassion and a beauty that surely only comes from walking down that path of suffering and remaining faithful to the Lord. When I got in my car it took several minutes before I could even turn on the radio. I just had to be silent and meditate on the fact that our suffering and our comfort are not just for us, but for others. If you'd like to share, how has God used suffering in your life to comfort others? Or how have other believers comforted you with the comfort they have received? In fourth grade, my reading class revolved around a program called Future Problem Solving, also known as FPS. For the next three years, my peers and I were challenged to come up with detailed solutions for major problems affecting the world. The first year our theme was the destruction of the rain forest. If by any chance you were also in FPS, I'm sorry if this post brings on an episode of PTSD. Our little class of ten-year-olds was divided into groups of four. Within those groups we had to analyze the big problems - like deforestation - and come up with tons of problematic scenarios that fell under them. (Curtis, does this explain anything to you?) For example, the earth was going to run out of oxygen if the rainforests disappeared. Or, we could unknowingly destroy and eradicate a plant species that held the cure for cancer. I took this to mean that we were all going to die if I didn't do a good job at future problem solving. Then we had to write essays on the solutions to these problems. And it was timed. Whichever group showed most promise got to go to Austin for the real competition. (Oh goody!) The pressure to anticipate disaster, solve the world's most complex issues, and do this before the timer went off was ridiculously intense. Insane, really. I vividly remember students hyperventilating in class and myself planning how I could run home and escape it all. A fourth, fifth or sixth grader does not have the wisdom to see that the weight of the world does not actually rest on her shoulders. FPS taught me two things - anxiety and tree hugging. I developed a deep passion for the rainforest and endangered animals. My father, who was confounded that such an idealistic child could come from himself, didn't really want to hear all the "bull crap" I was learning about the rainforest. He smelled politics behind what we were learning and it made him gag. Anyway, I might be living in California in a redwood tree right now if it weren't for him tempering my passion for the trees. There is a certain two mile stretch of road between my house and my kids' school that I drive at least four times a week. It's a beautiful drive that takes you over a big creek and through huge pine and oak trees. There's a horse farm, an alpaca farm, and several other nice properties that I enjoy looking at. This area is on a flood plain because of the creek, so it's very green and pretty. Well, because of people like me who drive down that road so often, the county is widening the road. Last week men were out chopping down the enormous trees. The smell of pine filled the car as we zoomed by. It was so heartbreaking. Every time I came and went, more trees were gone. Today I saw all of their stumps. I had to talk myself out of crying. The trees don't have feelings. You'll forget how pretty it used to be. Why do you feel so much righteous indignation about trees? Because I live in beautiful Suburbia. Things are so neat and clean here that I can be deceived into thinking that our worst problem is the loss of trees. I have the privilege of believing that my neighborhood's greatest injustice is that some people let their dogs poop on the sidewalk and don't clean it up. The biggest hardship in my kids' school life may be that their teacher goes on maternity leave. If these are the kinds of burdens I have, I need to look for someone with bigger burdens and help lighten their load. On our date last week I told Curtis I was ready to go back to Guatemala. Among other things, I was discouraged about my sadness over the trees and I needed to get a reality check. For the next few days we got letters from each one of our Compassion kids. 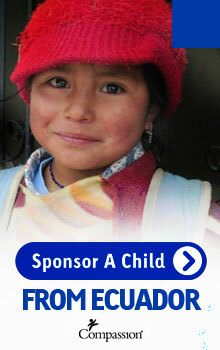 I was reminded to get online and give to Compassion's Christmas gift fund. While I was doing that, I sent a message to each one of them through the web site. I thanked God for Stefanie's sweet smile, for her mother who has such high hopes for her, and for the amazing day we spent together in September. I thanked Him for Marlon in Honduras who is turning into a young man. His 13th birthday is this week. He told me he cares more about his education than about sports. I thanked God for sweet Putul in India whose translated letters I can barely understand. What different cultures we live in. What a privilege to be a part of her life in a way that was orchestrated by God. After about an hour of pouring my heart out to these children, my soul was restored. Technically, we are the ones giving them gifts, but what they give us is priceless. If we engage with people outside of our bubbles, we get to stop crying over trees, dog poop, and teachers taking maternity leave. We can be rescued from our illusions. We can pour out, love sacrificially, live beyond ourselves, and get over ourselves. And I am first in line as one who needs to get over herself. Our community is having an outbreak of teen suicides. One of them has been in the news for the last month. Another happened this weekend. Suburban kids may have everything they need physically, but their souls still need Christ's unfailing love. Even in the prettiest neighborhoods, children are being victimized by people they should be able to trust. Spouses are married to addicts and abusers and are hanging on by a thread. Do we take the time to see? To go deeper than casual talk with those we meet? Do we give the woman who intimidates us because she's skinnier in her skinny jeans a chance to be real? Because her perfect appearance doesn't exclude her from suffering. We need to engage with people outside our bubbles. We need to pray, give and go. And those of us in the burbs need to let the bubble burst about where we live. There are ministry opportunities all around us. Give us eyes to see past the trees, Lord. To me, the most beautiful thing about MDO/preschool is the ability to grocery shop and fold laundry alone. I may or may not also enjoy pretending to be in the ranks of ladies who lunch. So last Tuesday I drove my little beloveds to school and, having no fancy morning plans, I made a beeline for the HEB. I had breakfast tacos in mind for dinner, so the first thing I did was go to the bakery and look for the fresh tortillas. They are a-m-a-z-i-n-g. Sadly, there was only a small stack of wheat ones. I've actually tried them with tacos before and didn't care for them. Nope! I wanted plain ole wonderful white flour. I could see the ladies rolling the dough into balls, so I had high hopes that I would leave the store with my treasure in hand. I went up and down every aisle like a good little shopper and then revisited the bakery before checking out. Behold, a big stack of fresh tortillas was waiting for me! They were still hot and the bag was steamy. It was all I could do to wait until I got home to eat one. That night I got started on the breakfast taco feast. I had potatoes o'brien or whatever they're called, breakfast sausage, cheese, and eggs. I thought there may be an actual recipe in my Pioneer Woman cookbook and sure enough, there was. Eventually we sat down to eat and I was just so pleased with myself and my fresh tortillas. I mean, they totally scored me some Proverbs 31 points. Plus, anytime I open a cookbook I feel like I'm every woman. But something was missing. My first breakfast taco left something to be desired. I thought it might need some spice, so I put salsa verde on the second one. It was a no go. By then I knew what the problem was. 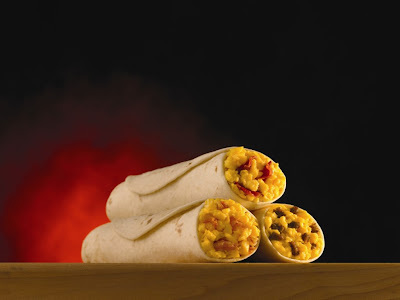 I just didn't want to give in to the simple, brutish taste developed in me after years of eating taquitos at Whataburger between the magical hours of 11 PM and 11 AM! It was do or die, people. Eat a third and do it up right, or mourn what could have been. You know where this is going. I went to the fridge and got a slice of processed cheese. I unwrapped it, put it on a tortilla, and spooned the egg filling on top of it. Then, I put a bit of red salsa on it as a shout out to the little picante packets from Whataburger. Finally, please don't hate me, I nuked it in the microwave to melt the cheese. When you bite into a breakfast taquito and the cheese has become one with the tortilla...and the picante drips down your arm...and the sausage and eggs are having a party...it is not too good to be true. All is right in your world for those three minutes. Truth be told, I'm not fancy. I'm not sophisticated. I'm not a lady who lunches. But I can make a phenomenal Whataburger taquito. And since we're being honest, I can also make a mean Egg McMuffin.